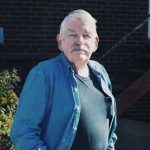 Ben Bristoll distributed The Appalachian Voice is Roanoke, Va., on his bike and lives his life as sustainably as possible. This year marks the 20th anniversary of The Appalachian Voice. 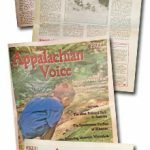 Learn how the newspaper got its start and how the organization, Appalachian Voices, came into being a year later. 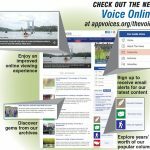 We are delighted to announce that all the great content found in the print edition of our beloved bi-monthly publication, The Appalachian Voice, is now available on our website, through our newly revamped online presence. Before diving in to read the latest issue of The Voice online, take a moment to learn about the new features you’ll find inside. Aug./Sept. 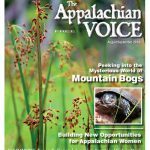 issue of The Appalachian Voice released! 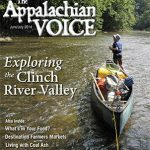 The latest issue of The Appalachian Voice features a wide range of stories. Read about everything from mountain bogs to fracking regulations and opportunities for rural Appalachian women in the online edtition of our bimonthly newspaper. Dive into summer with the June/July issue of The Appalachian Voice, featuring ecotourism attractions in southwest Virginia, destination farmers markets and environmental news coverage. Learn about genetically modified organisms and what some common labels really mean about your food. Investigate the issues surrounding coal, coal ash and carbon dioxide. This latest mountain news reporting encourages you to get out and explore your community. 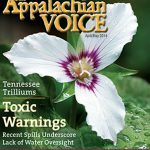 This latest issue of The Appalachian Voice explores some of the pressing economic and environmental hardships faced by the region today. 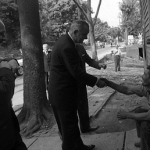 Read about the ongoing water crises in West Virginia and along the Dan River of North Carolina and Virginia, the continued challenges in the War on Poverty, and the people who are dedicated to achieving solutions. 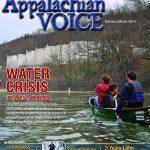 As the cover photo indicates, the latest issue of The Appalachian Voice features coverage of the ongoing water crisis in West Virginia water crisis, but there is much more Appalachia-inspired content inside too — from pieces sharing seasonal ways to enjoy the beauty of Appalachia to stories about significant points in our past such the TVA disaster, which occurred 5-years ago this past December. Here’s a rundown of featured stories you’ll find in this issue of The Voice. On this day 50 years ago, President Lyndon Johnson sat on a front porch of a weary-looking eastern Kentucky home and declared war on poverty. At the time, one in three Appalachians were considered poor. The poverty rate in the region is now closer to the national average — 16.1 percent in Appalachia compared to 14.3 percent nationally — but, as you might suspect, those statistics tell only part of the story. Economic disparities between Appalachian counties and sub-regions remain high, and, as it was in 1964, eastern Kentucky remains a focal point.